I begin with this admission against Jonah’s supposed interest to point out to his many detractors on the right that he is actually on our side. A lot of my friends are on a hair trigger with everything Jonah says or writes these days because of his relentless criticism of Trump. (For some reason most of my critical friends seem to be named Julie. A statistician will probably tell me this can’t be chance—it must be a conspiracy! Though actually it is the pseudonymous “Tom Doniphon” who is working overtime at American Greatness to smack Jonah’s book around.) The ongoing divisions over Trump are provoking complaints that, among other sins, Jonah has committed a literary appropriation (heh) of James Burnham’s famous 1962 title. This is a silly charge, as Harry Jaffa first explained to me about why he wasn’t bothered by the many other authors who also titled their Lincoln books A New Birth of Freedom. Now, I have my own specific criticisms of Jonah’s book; in fact I have enough nits that I can probably knit a small sweater. Yes, he has some details of Michael Anton’s biography wrong; yes, his handling of the Declaration of Independence is sloppy in a couple of respects (but correct on the essentials); yes, Lockeans in every corner of the ring will want to dispute his summary accounts of Lockeanism as incomplete. (The irony of the long-running disputes about Locke is that they resemble an intellectual state of nature out of which no civil society seems ever likely to arise. But that’s a subject for another day—and 500 more books.) At the end of the day, as I shall try to explain, all of these nits will yield a sweater barely suitable to cover up an anorexic Barbie doll. Goldberg’s book is a big, baggy, sometimes frustrating, often brilliant combination of intellectual history and political essay. He says that the original manuscript was twice as long as the final product; it certainly should have been much further pruned. Wrong, and wrong. It’s not the book that’s baggy. Jonah’s pants are baggy, and perhaps Keiper is coming closer to explaining Trump’s famously inscrutable dig at Jonah’s supposed inability to buy trousers. It’s the last sentence—“it certainly should have been much further pruned”—that is the wrongest part of Keiper’s evaluation. As Jonah has explained, the original manuscript of the book was more than twice as long as the final product, and was reduced at the request of his editors at CrownForum books (my publisher, I’ll add; they were very indulgent of my preposterous notion of writing a huge two-volume political biography of the life and times of Reagan, for which extraordinary latitude I’ll always be grateful). I understand why the publisher would want the book, or any book, to be shorter, and I’m sure the shorter length aids overall sales, but I think the book is in fact too short. I would like to have had the longer version. Too bad we can’t do books after the fashion of movies, with a “writer’s original edition” like we have a “director’s cut” of so many movies. Another way of getting at the inherent defect—but necessity—of short books is to ask for a show of hands for the following question: how many of you have read even one volume of Deirdre McCloskey’s magisterial trilogy consisting of Bourgeois Dignity, Bourgeois Virtues, and Bourgeois Equality? Confession: I have only read a little of McCloskey’s triptych, but have long been a huge fan of all of McCloskey’s remarkable body of work, and agree with Jonah about McCloskey’s originality and deep cross-disciplinary perception. McCloskey is one of the very few senior academics who can rightly be called a polymath of the old school. Just have a look at McCloskey’s author description in her books: “Distinguished Professor of Economics, History, English, and Communication at the University of Illinois at Chicago.” She really is an Erasmus for our time. And in fact McCloskey is one of the inspirations and sources for some of the main themes in Suicide. McCloskey set out to get at a surprising mystery: there is no consensus about what causes economic growth, or an explanation for why the “industrial revolution” began to take off like a rocket roughly 300 years ago after centuries of essentially no economic growth at all. (The subtitle of Bourgeois Dignity is Why Economics Can’t Explain the Modern World.) The standard factors we learned in Econ 101 way back when—land, labor and capital—aren’t the driver, nor is technological progress. Institutions matter, yes, as does most crucially classical liberalism. But our picture of the prosperity and success of the West is getting more out of focus as time goes on. The result is a situation in which the ambition to write broad-gauge synoptic accounts of the social order of democratic capitalism is nearly extinct. There are a few notable and partial exceptions, such as Steven Pinker’s new book Enlightenment Now, offering a robust defense of Enlightenment liberalism. (And the left is fiercely attacking Pinker, who is otherwise an orthodox modern liberal, for this sin.) Jonah’s book is another, except that it is much more ambitious and wide-ranging than anything else on offer today. One might try to make something of a contradiction out of Jonah’s embrace of human nature with his parallel argument that what we today deplore as selfish tribalism is in fact the natural state of humanity, and that liberal notions of equal rights—and democratic capitalism—are in fact unnatural, and are undermined precisely by its very success. Here perhaps he is restating some of the ideas worked out a generation ago by Daniel Bell, but Joseph Schumpeter is the acknowledged larger inspiration for his argument. The point is, uncivilized human nature makes our social order always prone to the same law of entropy as our physical order, and as such is the chief refutation of the easygoing historicism behind the favorite modern liberal cliché about “the side of history.” Civilization takes work, as much to maintain it as to create it in the first place. Or as John Stuart Mill suggested, the chief defect of Hegelian liberalism is the assumption that the progress of humanity from barbarism to civilization is an irreversible process. When we reflect that such benefits have been secured to the people not by confiscation of the property of the rich or by arbitrary taxation but simply by business enterprise—out of which the promoters themselves have made colossal fortunes, one cannot fail to be impressed with the excellence of the active system. But, Churchill added, in terms close to Jonah’s point, that American capitalism is “not pretty or romantic, but great and utilitarian.” And understanding the romantic rebellion against liberal democracy and capitalism is one of the major themes of Suicide of the West. Sure, this may not be exactly new, but to adapt Dr. Johnson, reminding is informing. 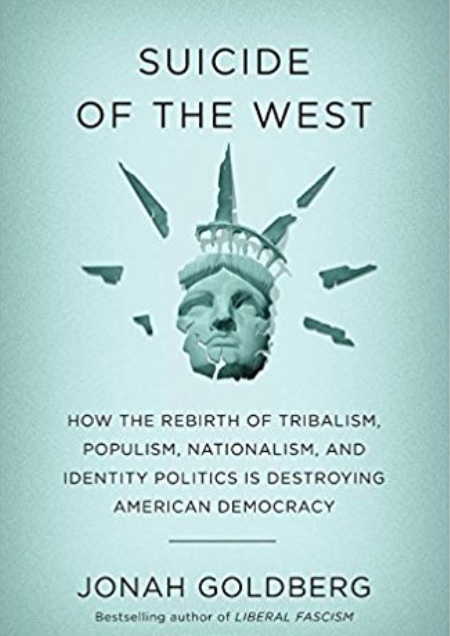 In the early- to mid-1990s we thought we had won on the major premises of politics and policy—Francis Fukuyama told us so!—such that what was needed from the likes of us was the technical work of unraveling piece-by-piece the architecture of the administrative-welfare state. The reasons for thinking this way were all around us, from the spectacular fall of the Berlin Wall to the market liberalizations proceeding apace in nearly every corner of the world to the spectacular rout of Hillarycare and the noticeable acceptance of market logic within Clintonite & Blairist liberalism. These encouraging signs were profoundly misleading. The problem with thinking you are riding a “wave of history” is that the wave might leave you stranded on a sandbar far from shore. Just ask Newt. . .
How did the Left get the drop on us? I have a field theory for this that is simple but hopefully not simplistic. We should not repair behind exogenous excuses about the surprise of the housing bubble/financial collapse and the extraordinary phenomenon of Obamamania. The seeds of decay and regress should have been evident long before these events. We should be honest: we—our cause, our movement—became complacent. We became too narrowly focused on policy studies to the exclusion of the sustained public argument about the principles and practices of a free society that were the predicate of policy reforms. We forgot the “public” part of “public policy” studies. . .
Who ever thought, after NAFTA for example, that the principles and arguments for free trade would require re-articulation? . . . Hence we need books—and a lot more books—like Suicide of the West that reach a mass public with original and unconventional popular language and cross-cutting arguments. All that Trump stuff is a sideshow. . .